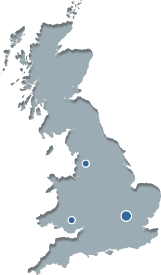 The SFS Manufacturing Group Ltd operates from three locations. In Luton we manufacture our range of silicone hoses, solid silicone extrusions, fabricated gaskets, calendered silicone sheet, hygienic hose assemblies. Our Blackburn site specialises in the manufacture of silicone sponge extrusions, silicone sponge sheet, solid silicone extrusions and fabricated gaskets. Our facility in Tonypandy produces tooling for our hose division, as well as fabricated metal items.